“Temple Run 2” is the sequel to “Temple Run” that millions played. It is a 3D platform and endless runner game in which players run through 3D mazes for as long as they can to clock up higher scores. 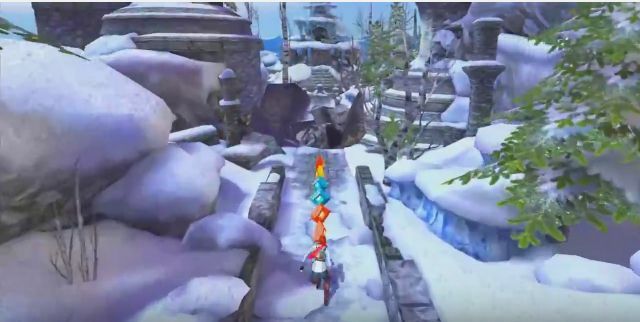 Now “Temple Run 2” has been recently updated with the Frozen Shadows map, giving players a new frosty maze to sprint through. 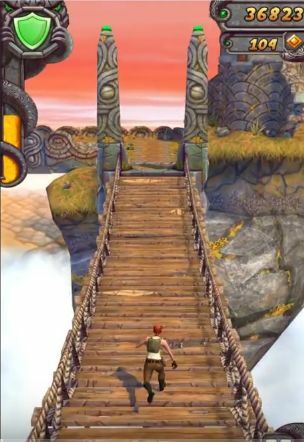 The playability of the original “Temple Run” made it a hit, and “Temple Run 2” retains the basic swipe controls from the first title. Players swipe up and down to jump and slide and left and right to turn corners. In addition, you can also tilt the tablet or phone to move the runner to the right or left side of a path. Imangi has also added artifacts and power-ups to give the game a little more variety. Aside from clocking up higher scores, players can also pick up artifacts and coins in the mazes. With the coins you can invest in new power-ups or unlock new runners to run with. Gems are also included in the mazes that give you a chance to continue playing once your runner has been halted, and they unlock new runners such as Santa Claus. 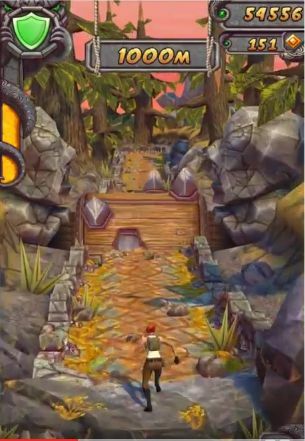 “Temple Run’s” glorious 3D mazes have also been another of the game’s highlights.”Temple Run 2″ has not one, but two mazes to run through with the Frozen Shadows update. In addition to that, you can run through Sky Summit that includes zip lines and minecarts. The maps have richly detailed 3D landscapes. The terrain is smoother than the original with more curved landscapes. However, the game does include some pop ups with landscape details popping out of nowhere instead of appearing smoothly on the horizon. The game has a couple of soundtracks for the two separate maps. You can listen to its music at this page. Some sound effects are lacking on the Sky Summit map. For example, rushing waterfalls, rotating razors and falling rocks that snap through wooden planks have no sound effects. “Temple Run 2” is freely available for both the Android and iOS platforms. So it offers better value than the original game. It does include IAP options, but they are hardly an essential addition. With enhanced graphics, new maps and the same great gameplay, “Temple Run 2” is an enhancement on the original. Imangi has also hinted that further updates could be in store, which might mean another new map for the game. You can find more details at this Google Play page. TESTED ON: ANDROID 4.4 KITE TABLET. IT IS ALSO AVAILABLE FOR THE IOS 6 PLATFORM OR LATER.